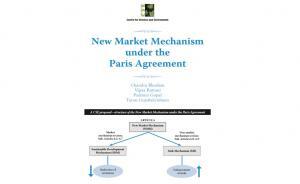 THE PARIS AGREEMENT, which entered into force on 4 November 2016, has re-established the importance of using market mechanisms to galvanize action against climate change. Prior to Paris, the Kyoto Protocol committed the developed country Parties to binding emission reductions targets, and created three market-based mechanisms-Emissions Trading Mechanism (ET), Clean Development Mechanism (CDM) and Joint Implementation (JI)-to aid them in achieving these targets. However, many issues plagued the Kyoto mechanisms and they failed to generate significant overall reductions in global emissions (see Box: Lessons from the Kyoto Protocol). It is imperative that the New Market Mechanism (NMM) under Article 6 of the Paris Agreement is more robust, accountable, transparent and-most importantly-sustainable, to avoid repeating the mistakes of previous market mechanisms. The Paris Rulebook, which would make the Paris Agreement operational, is currently being negotiated with the aim of being adopted at the 24th session of the Conference of the Parties (COP24) in December 2018. This policy brief is concerned with the design and nature of rules needed to activate Article 6-the portion of the Agreement which deals with markets.